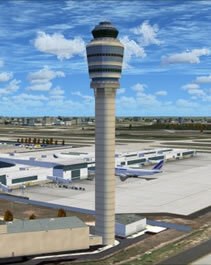 For Hotels near Atlanta Airport call 1-800-327-1390. 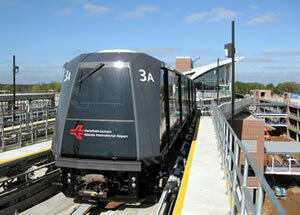 The Atlanta Airport people mover systems are designed to get you where you are going, as quickly as possible. The underground automated people mover connects all terminals by nine four car trains which operate on a 3 ? mile loop track, the time between trains at any of the 14 stations along the route is approximately two minutes. In 1925 the land that an old racetrack was on, was leased by the city and named Candler Field, the first commercial flight was in September of 1926 with a regularly scheduled mail delivery flight. In 1971 the airport was named William B. Hartsfield Atlanta Airport in honor of the mayor that made sure the airport was developed, and in October of 2003 the name was changed again to Hartsfield-Jackson Atlanta International Airport in recognition of Mayor Maynard Jackson's contribution to the modernization of the Atlanta Airport.